That was the promise Chinese President Deng Xiapong flaunted 30 years ago when he made a deal with the British government for the return of Hong Kong to China. He declared that the citizens of Hong Kong would enjoy free elections and universal suffrage (everybody can vote), even as mainland Chinese lived under communist dictatorship. 30 years on, Hong Kong is tired of waiting: as its students, democrats and citizens have taken the government by surprise with massive protests for democracy. And yet there seems to be no easy exit in this stalemate between the Party and the people. The protests began almost a month ago, when Hong Kong’s famous activist organization, Occupy Central with Love & Peace, announced its opposition to the Chinese government’s proposal for the election of the next Chief Executive of Hong Kong. The Chief Executive is Hong Kong’s head of government, who was previously elected by a select electoral committee and appointed by the government of mainland China after being approved by the Communist Party. When the British finally handed Hong Kong over in 1997, it was agreed that this system would stop after 20 years, and Deng’s promise of universal suffrage would be realized in 2017. There would be no more committees; the people of Hong Kong would choose their leader. The Chinese government’s August 31st announcement was just that: universal suffrage would be granted, but with the condition that all candidates have to be approved by the Communist Party before standing, making sure no anti-Beijing candidate can become Chief Executive. This was met with heavy criticism from Hong Kong’s staunch democrats, but Occupy Central were unsure of the response they would get. On September 22nd, thousands of students from the Hong Kong Federation of Students and Scholarism (founded by Joshua Wong) movements, and countless regular university-goers and citizens boycotted school, college, work, etc. 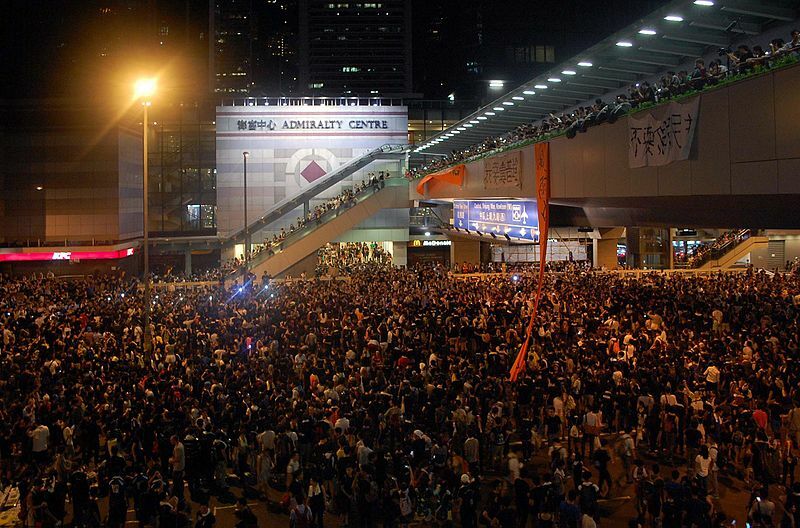 Sittings and protests outside the Chief Executive Leqiang’s office (Leqiang has supported China’s proposal); and with this vote of confidence, Occupy Central announced a full scale protest beginning on 28th September 2014. They had planned to begin in October, but the harsh reaction of the government in using the riot police, and arresting Joshua Wong and other student leaders prompted them to prepone. The protest has acquired the name “Umbrella Revolution”, because of the umbrellas many protesters are carrying with them – to protect themselves from the rain, the sun and the police’s pepper sprays. They demand free and fair elections, at least the resignation of Leqiang: who has supported China’s proposal, and “betrayed” them. The protests began peaceful and disciplined: the leaders asking for complete non-violence, and most amazingly attempting to organize a cleanup by the students every night: removing the litter from the very area they had occupied all day. However, things have turned ugly since: violence between citizens opposing the protests and the protesters; and more recently, aggressive police action have increased tensions in Hong Kong. While opposition to the activists and early police action seemed to be causing the popularity and support for the protests to reduce; recent, more ruthless police action and attacks on the protesters by masked men have caused a sudden resurgence in the protests. The Chinese government is worried about the protests: if it allows them to go on, they become a flare of resistance to inspire people all over the country: people whose dissatisfaction is become increasingly visible. Especially in troublesome regions like Xinjiang and Tibet, and the Hong Kong-like sister state of Taiwan. On Weibo, the Chinese Twitter, the internet censors have tried to ban one in every 5 posts mentioning Hong Kong: initially in a bid to prevent the mainlanders from realizing what was happening in the city-state, and have now pursued a tactic of removing all posts showing solidarity with or supporting the protests, promoting those that condemn them. Experts believe that the government may want to end the protests: calling the protesters “extremists” and promising “resolute action”, but at the same time does not want to undermine one of the world’s biggest trading centres, and one of its biggest economic contributors. Its original plan was to wait, in the hope that the protests fizzle out: pro-Beijing protesters have also come onto the streets in numbers, voicing their support for the government outside Leqiang’s home. After smouldering tension and hostility between the two groups broke out into clashes, intermittent violence has been seen around the city. The government for now hopes such incidents, and the lack of a centralized leadership destroy the protests before they get any worse. However, the worsening situation in Xinjiang, and the economic troubles in Hong Kong make this a bad time for protests. At the end of the first week of October, it looked like it was all but over. We are two weeks later and the protesters look stronger than ever: Beijing is getting impatient: as the shockingly violent crackdown on Mong Kok street on October 17 shows. Inevitable comparisons to the infamous Tiananmen Square protests have emerged: that became a publicity disaster for China; the government may try a different tack this time. Hong Kong is different from any city in the mainland; it is an international city, and heavy handed repression will not go unnoticed by the international community, or unfelt by the Chinese economy. The protesters feel they have been cheated of the “two systems” they were promised, and have waited long enough for democracy. But the current stalemate points to the possibility that they may have to wait longer still.